In German-occupied France during World War 1, Sophie is a young woman struggling to feed her family. Her husband, an artist, is fighting in the war. When Sophie catches the eye of the German commander, he arranges for her to serve meals to the occupying soldiers at her inn. This provides Sophie with access to food for her family. She also sneaks supplies to the sick and elderly in the village when she can. But the commander wants more from Sophie than a hot meal. He is especially intrigued with a portrait Sophie’s husband painted of her when they first fell in love. When Sophie finds out her husband has been captured and sent to prison camp, in desperation, she tries to bribe the commander. She offers the portrait; he takes her to bed. The people of the village turn on Sophie (in spite of the way she shared her stolen food) and she is dragged off to prison camp herself in disgrace. In some fever-addled part of her brain, Sophie imagines the commander has done this to reunite her with her husband. Lawsuits ensue. Liv digs herself deeper and deeper into debt in efforts to assert her claim on the painting. Needless to say, she and Paul cannoy speak to one another anymore. Heartbroken and broke, Liz tries desperately to hang on to memories of love. Will she keep the painting and get a new chance at love? Or will she, like Sophie, trade all that she has and still not get what she wants? After the bestselling success of Jojo Moyes last book, Me Before You, several of her books have been reprinted (I think for the first time in America; they were published in Britain before.) I was excited to read more from an author I liked. 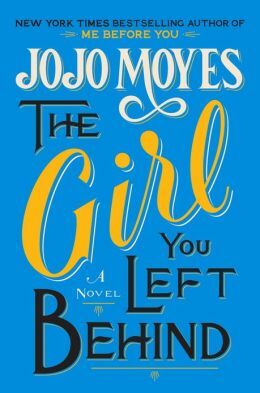 The Girl You Left Behind was not quite as good as Me Before You, but after all there is a reason I only have ten “Top 10” books a year. This one was still quite enjoyable and I look forward to picking up the rest of Jojo Moyes’ books. You might like: Hotel on the Corner of Bitter and Sweet by Ford. Sarah’s Key by de Rosnay. This entry was posted in Fiction and tagged art, book review, fiction, love, world war 1. Bookmark the permalink.